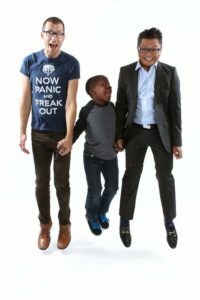 “I was booked to perform at one of her R Family Vacations cruises in 2007,” recalls actor Alec Mapa, telling Gays With Kids that he and husband Jamie Hebert were surrounded by so many LGBT families that they just knew fatherhood was in the cards for them, too. “I met a social worker on the ship specializing in helping LGBT families find foster-adopt placement,” Mapa continues, describing how he got her card and promptly lost it back on land in the junk drawer that is his garage. What happened next was kismet. If you don’t know “America’s Favorite Gaysian,” you know his face: Mapa’s resume is catalog of critically-acclaimed comedy, from “Desperate Housewives” and “Ugly Betty” (where he played the hyperkinetic Suzuki St. Pierre) to “Devious Maids” and “The Gossip Queens.” He met producer Hebert on the set of his one-man show “Drama” in 2002 and the two have been an item ever since, marrying in 2008. But this journey to fatherhood differs from most. 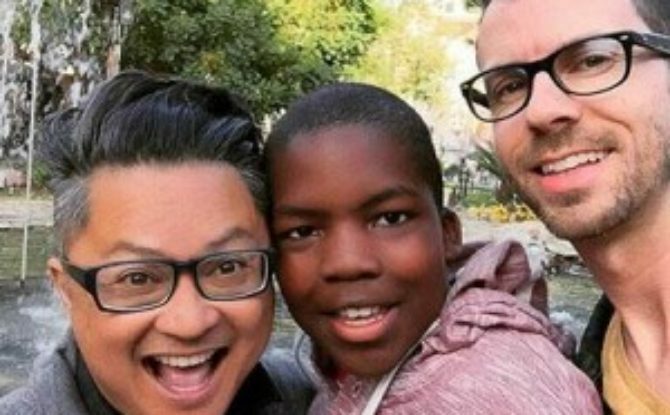 When Zion came into their lives, he was the kind of kid most prospective parents don’t touch: He was African-American, he was a boy, and, at age five, he was old. Moreover, he was a foster-child, meaning his birthmother had not yet signed away her parental rights. To top it off, he had already been placed with four other families before Alec and Jamie got a hold of him. Foster care and adoption are two different legal animals. The latter completely and permanently signs over the rights and responsibilities of the child from the birthparents to the adoptive parents. The child takes the surname of their new family and loses all automatic rights of inheritance with the old. A foster child can, and often does, maintain ties with their biological family even while in the care of another, and the biological parents have the final legal say in decisions concerning their child. Additionally, fostering lacks the permanency of adoption; children often shuffle from one foster family to another until they reach the age of 18, whereupon they are effectively cut loose. For all the good intentions, it is no secret American foster care is overburdened, with up to 250,000 children entering yearly. It’s not all doom and gloom; 33 percent are back with their families within 11 months, and only seven percent of foster kids remain in care for more than five years. However, the longer a child stays in, the harder it is to get out. Chances for permanent placement drop drastically for children over five, siblings, children of color, and for self-identified LGBTQ youth. Some leave the system only after “aging out” of it, and can face the possibility of being family-less. The numbers to which Valenza refers come from a 2013 study conducted by the Williams Institute, a think tank at UCLA Law, confirming no significant difference in children raised by straight and LGBTQ parents, and stated two million gay, lesbian, and bisexual people express an interest in foster parenting. That number dwarfs the 400,000 children in the American foster care system, 104,000 of whom are available for adoption as of this writing.